The undefeated Mountain Brook Spartans travel to Hurdmont Park to play the Oak Mountain Eagles in a Class 7A, Region 3 matchup. The Spartans look to continue their winning ways as they take on the Eagles who are coming off a disappointing loss to Class 6A Pelham last week. Mountain Brook (5-0, 3-0) have region wins over Vestavia Hills, Tuscaloosa County and Spain Park while the Eagles are looking for their first region win. Oak Mountain had the brutal schedule of Hewitt-Trussville, Thompson and Hoover going 0-3 against the top three teams in the region. Mountain Brook will face that gauntlet of teams in the second half of the season. Mountain Brook had to replace eight starters off of the 2017 team and have been improving each week to this point of the season. "Some times youth can give you energy, but we are very inexperienced on offense" said Spartans head coach Chris Yeager. "The competition has got progressively tougher and we have progressively improved on offense each week. Our schedule demands us to get better each week. That has been a pleasant thing to happen watching the progress." At quarterback is sophomore Strother Gibbs leading the Spartans offense. Gibbs was forced into varsity duty as an eighth grader in varsity competition in a spring game against Shades Valley at Troy University when starting quarterback Hamp Sissom was injured. "He didn't even flinch playing in that varsity game," added Yeager. "That experience went a long way on getting confidence. He gained a lot of respect from our players. He does belong in the conversation with all the great quarterbacks that we have in our region." For the Spartans at running back is AJ Gates and Daniel Wilbanks. Gates can shift it in any gear and run around you in a quick second while Wilbanks is the hammer that likes to run north and south. "AJ is our shake and bake type guy," said Yeager. "Daniel is our downhill runner. You have to play physical in this region if you want to win on Friday nights." Add Sam Higgins in the mix to keep the fresh legs for the Spartans. Even though Gates and Wilbanks rotate in don't be surprised to see them both on the field at the same time in different packages from the Spartans. At receiver Hamp Greene brings a lot of experience at receiver. Bring in Crawford Golden, Pierce Rodrigues, Blake Roth and William Miller round out the Spartans at receivers. On the offensive line, coach Yeager is one of the best in the state in getting lineman ready to play. Andrew Fleming, Hugh Lawson, Hayden McDonald, John Wetzler and Michael Muncuso round out the offensive line. The strength of the defense is at linebacker. Colton Yeager has been out the past two weeks and looks to make it back Thursday night for the Spartans. Linebacker Clark Griffin and Edward Cain have played really well this season for the Spartans. They will need to be healthy for the stretch drive with upcoming games with Hewitt-Trussvile, Thompson and Hoover on the horizon. Griffin stands at 5-foot-5 and 175 pounds and has been very consistent all season. "Colton being a coaches son and for his love of the game has been really good," added Yeager. "Clark is probably one of our leading tacklers. The defensive front has played extremely well this season." On the defensive front of James Burkett, Trey Gory, Ford Kelly, Jay Barze and Matthew Lee have played extremely well in the Spartans five victories this season. They do a great job of setting up the linebackers and taking on blockers up front. Coach Yeager says they have been a big part of the success in the Spartans defense this season. In the secondary, Alex Wasington, Grant Griffin, Robert Reed and Autrey Baynes lead the way for the Spartans. 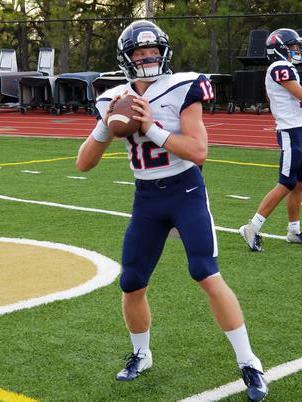 For Oak Mountain (1-4, 0-3), the Eagles are coming off a hard loss to Pelham (21-52) Friday night and look to rebound coming back to region play this Thursday night. "Were playing a well coached team being a strong team with good speed," said Eagles coach Chris Bell. "They might not have the flash as maybe some of the other teams in our region but they are a great team. If we don't play physical like we didn't do at Pelham, it won't matter who we play. We played three great region teams and we can't relax in the next half of our season. We have to come to play every week. These are the things we talk about. We are good enough to beat anyone on our schedule but our margin of error is slim. We have to bring our A-game every week. Playing in our region can be a tall order but that is the task that is in front of us. We had a decent week of practice and we are going to get after it. We look to play much better." For Oak Mountain, the Eagles call on freshman Evan Smith to run the show. "We have to keep putting Evan in situations for him to be a great quarterback for our team," said Bell. "We are working on the passing game and it all doesn't fall on his shoulders but he has to make the correct reads on every play running the option and he has done a great job and is still learning the position. There are times we have to throw the ball away, but were asking a lot from a freshman. The best one we had at under my coaching is Warren Shader. He had a good grasp of it and started three years. Warren as a sophomore and Evan as a freshman is on par. They both do different things well but I am very pleased where Evan is at a quarterback. He is really focused on the little things to be a very good quarterback. He is not an option quarterback but he is a great quarterback." At running back Luke Percer leads the way for the Eagles. He is a dynamic running back that can make a big play anytime he touches the ball. "Luke is a great player and is very talented," added Bell. "He is a great competitor and has great drive. He wants to be the best player that he can be. Also, he is a big leader of the team." Wide receiver Noah Young caught a touchdown pass against Pelham last week and will look to play a bigger role on the Eagles offense. The Oak Mountain defense will need to be at their best for the team to be successful. Defensive back Garrison Frisch is out for the year with an injury and he was a big part of our communication on the field for the Eagles and will be sorely missed. "Were asking a lot of our kids that came back on us against Pelham," said Bell. "We are going to simplify what we are going to do but we have to play fast and tackle a lot better against Pelham. We were not physical at all against Pelham and that has to change so we will see if what changes we make payoff this Thursday night." Defensive lineman Travis Thomasson, Carter Owens and Zy Strong will be called on to get the Eagles defense turned around against Mountain Brook. Linebackers Zay Brown, Jacob Fitzgerald, Jalen Thomas, Nikolas Heino will be a key part stopping the Spartans run game. With Pelham getting most of their yards on the ground last week, look for the Spartans to go the same route with their two talented running backs.